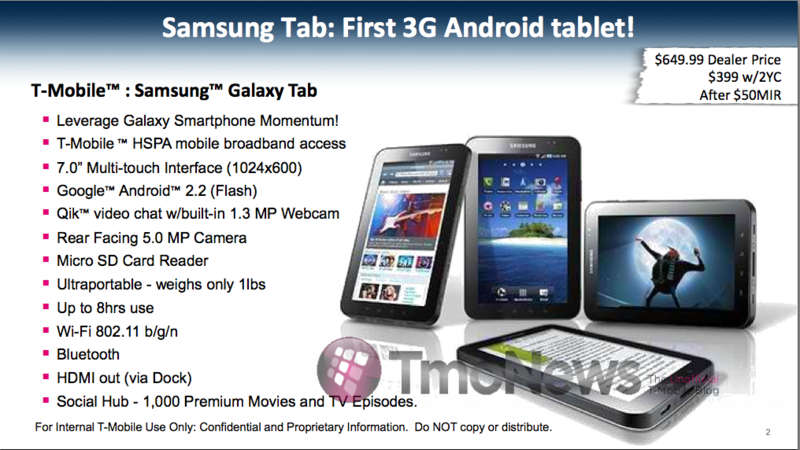 Earlier this week, BGR leaked a likely $399 on-contract price tag for the Sprint's version of the upcoming Galaxy Tab. 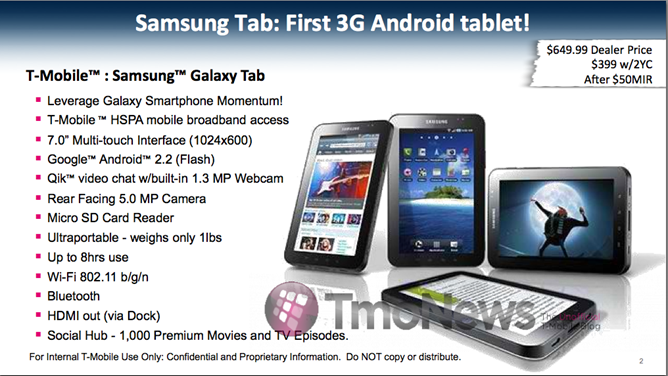 Today, TmoNews dug up some slides showing T-Mobile's version of the tablet coming with the same $399 price tag (on a 2-year contract of course), albeit after a $50 rebate. The version that will free you from the carrier's firm grip will make you part with an additional $250 and cost a whopping $649.99. Comparing this to the iPad, where $499 buys you a comparable WiFi-only 16GB version and $629 gets you the WiFi+3G one, the Tab fits kind of in the middle. 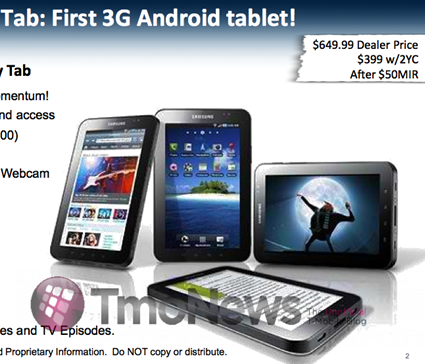 If you go for the contract price, it ends up being $250 cheaper than the 3G iPad. If, however, you don't like contracts, you're going to be paying $150 more than the WiFi-only iPad or $20 more than the WiFi+3G variant, but in either case get to keep the 3G capabilities in case you want to go month-to-month. Comparing the Tab to the iPad a bit further, we find the Tab having both rear and front-facing cameras, an HDMI output port, a better CPU, a microSD expansion slot, the ability to play Flash content, double the iPad's RAM and half the weight, not to mention all the other cool stuff that comes with FroYo. In the neutral zone, a 7" screen, which is 2.7" smaller than the iPad's, may appeal to some and seem too small to others. 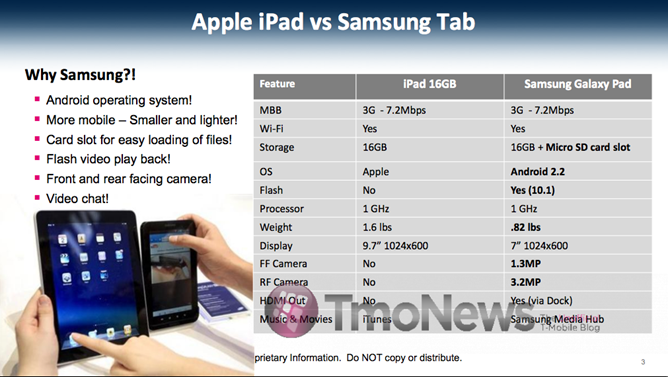 I personally would probably prefer something like an 8.5", but if I had to pick, I'd go for the 9.7". Finally, application-wise, the iPad is currently a clear winner and is likely to remain so for quite a while, at least until the Android Market figures out some decent apps and games that go well with the bigger screen. All in all, if the slides are indeed legitimate, I think the price points are a bit too high. The verdict, in my opinion, is still out because a lot will depend on the the monthly data costs. A $299 Tab on a contract without voice limitations (i.e. no voice at all) would make a whole lot more sense to me.